If they require specific content (Bio, Chem, OChem, Physics, Biochem, etc), you should have a strong foundation in this content. That means a B or higher average in the majority of that coursework. The tests are long, so it is as much about endurance as it is content mastery. You must practice sitting and reading for long periods of time. Multiple choice exams are different and require different strategies. By studying test taking strategies for your test, you may improve your ability to score higher. If your exam requires specific content, do not take the test until you have completed all of those courses. Some students are naturally good test takers and can commit the time to study alone. If that applies to you, you may not need a test prep course. Some health professions associations offer fee assistance for applicants. This often entails applying and submitting additional documentation, but by qualifying, you could receive discounted test rates, lower application fees and even waived supplemental application fees. Take a look to see if your program offers fee assistance. When speaking with an admissions office about test score requirements, it is best to ask, "What is your range?" rather than about the average. Averages are not minimums, and most schools seek to post higher averages. Take a look at the averages for several programs. Take a look at how scores will be reported initially. Is the MCAT absolutely required? Almost all U.S. medical schools require you to submit MCAT exam scores. Many schools do not accept MCAT exam scores that are more than three years old. How often can you take the MCAT? - The MCAT exam can be taking up to 3 times in a single testing year. - The MCAT exam can be taken up to 4 times in a two-year period. - The MCAT exam can be taken up to 7 times in a lifetime. If you have taken the MCAT once and did not earn a satisfactory score, please contact HPA to discuss a strategy for improvement. Do NOT take the MCAT without proper preparation. How long does it take to receive scores back? If you take the exam in April 2015 or May 2015, it will take longer than the typical 30-35 days. This is because extra time is needed to conduct the necessary analyses to set the score scale. Examinees who test in April or May will receive their scores before AMCAS begins sending applications to medical schools for the first time in early July. Please note, April 2015 and May 2015 examinees will also receive preliminary percentile rank ranges approximately three weeks after your exam date. These preliminary percentile rank ranges will show you how well you performed compared to other examinees who took the exam on that day. This will help you make a decision early about whether or not to retest or where to apply. Can I buy a sample test? We encourage you to take a full practice exam before you begin studying. The MCAT is a content-based test, but moreso, it is a test of endurance. At 7.5 hours, the test will test your ability to stay focused for a long period of time. This needs to be measured as well. It is best to attempt to test for that period of time initially to learn how much practice you need simply taking the test. With the results from a practice exam, you can direct your study of content areas, begin learning test taking strategies and train your body and mind to sit for extended periods of time reading and staying focused. You can purchase a practice exam from the AAMC for $25. Before taking the test, be sure you know the depth of content covered. Learn more here. Do you need a test prep course? 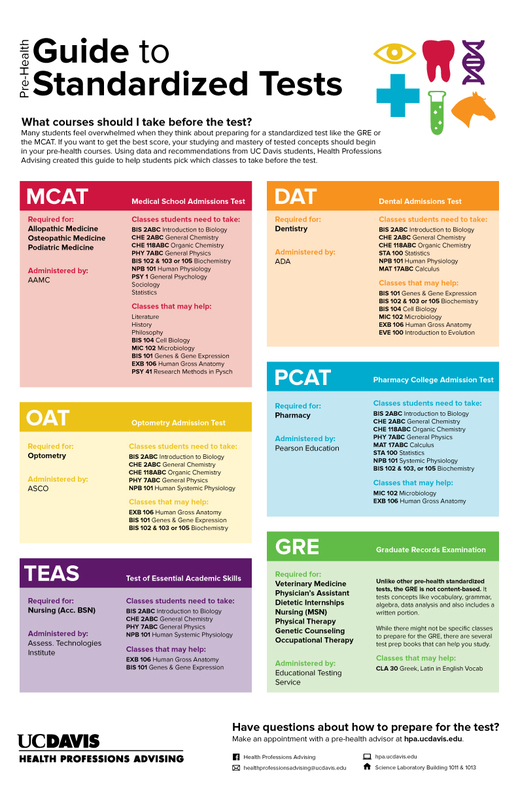 There are several free test prep companies offering courses for the MCAT. Choosing to use a test prep course is a personal decision. The content is limited to those areas covered by an entire first-year course in biology, general chemistry, and organic chemistry. The examination is comprised of 100 items: 40 biology items, 30 general chemistry items, and 30 organic chemistry items. Since separate sub-scores will be given for each of the three science sections, you should pace yourself through each section. A periodic table will be available for this test by clicking an Exhibit button. Includes various types of nonverbal visual acuity items. There are six sections in the Perceptual Ability Test. One section covers two-dimensional perception, while the other sections cover three-dimensional perception. It is important that you read and understand the instructions at the beginning of each section. You must pace yourself so that you complete all six sections of the Perceptual Ability Test within the given time frame. You are not permitted to use measuring devices (i.e., pencils, fingers, erasable note board) while taking the Perceptual Ability Test. Consists of three reading passages, each with 16 to 17 items. The reading passages are scientific in nature and may reflect topics covered in dental school. Applicants are encouraged to read each passage before attempting to answer the corresponding questions. The Reading Comprehension Test is presented in a split-screen format with the items presented on the upper half of the screen, and the reading passage presented in a scrollable format on the lower half of the screen. Measures your ability to reason with numbers, to manipulate numerical relationships, and deal intelligently with quantitative materials. For the DAT Practice Test, a calculator will not be present. However, a basic calculator will be available as a pop-up image on the screen for the Quantitative Reasoning Test section in the real DAT. Here is a sample of what the DAT will be like. You must wait 90 days between each testing attempt, and after three attempts, you must apply for permission to retest. The DAT cost $415, which includes the release of the score report to the schools you select on your initial application. Sending a report to additional schools later will cost $34 per school. Scores are released 3-4 weeks after the test date. The GRE cost $195, which includes score reports to four graduate programs. Additional reports cost $27 each. There are free test prep companies offering courses for the GRE. - Several free prep resources can be found on the ETS website. PCAT is required for pharmacy schools, although most California schools do not require the test. The PCAT also includes a Writing subtest. The PCAT is offered only ten times in a cycle. Here are a list of dates. You can take the PCAT five times. After the fifth attempt, you may be asked to provide documentation. All optometry schools require applicants take the OAT. Enroll today using Promo Code: UCDPHC1815 to save 15% off any product!